When you look at the recent success Penn State has had, the common fan can easily point out how successful their offenses have been and the types of players they’ve produced. College football knows Trace McSorley. The National Football League has a guy by the name of Saquon Barkley that also hails from Happy Valley. Most, though, do not realize that the Penn State defense ranked No. 1 in defensive sacks this past season. At an average of 3.62 sacks per game, totaling 47 on the year, nobody in America was better at getting to the quarterback and causing havoc in the backfield than the Nittany Lions. Here’s a look at what makes Penn State so successful at creating big losses in passing situations. The first thing you notice when watching Penn State’s defense play is how active their defensive linemen are on every play. 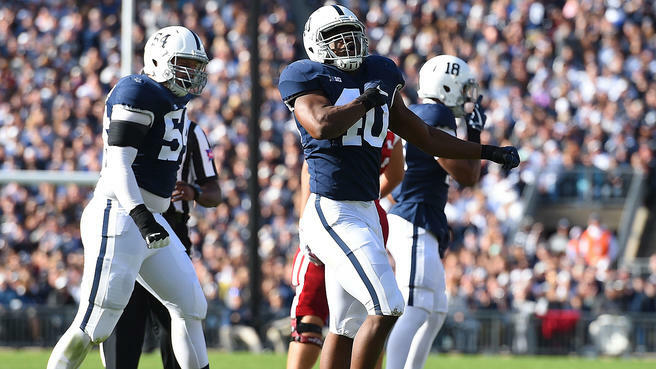 Penn State has an extremely hard-charging defensive line that rarely takes a play off. They are good with their hands and relentlessly pursue the quarterback during passing situations. Mixed in with this is the Nittany Lions use a number of line stunts to pick and roll to free players in the rush game. One example of this came versus the Michigan Wolverines. On this play, the Wolverines are attempting to set up a screen to slow down the Nittany Lion pass rush that had been harassing them the whole first half. Penn State runs a defensive end and defensive tackle stunt, with the tackle picking for the end to loop around and bring A-gap pressure. The A-gap pressure flushes the Michigan quarterback out of the pocket and into scramble mode where Penn State flourishes. Once in the open field, quarterbacks tend to struggle to gain yards against this defense because of how well the linebackers scrape contain. A major component to getting sacks is being able to create pressure without having to blitz. Penn State also utilizes a variety of fire zone blitzes that seems to give their opponents extreme fits. Against Appalachian State in an extremely competitive game, Penn State found themselves engaging in different fire zone blitzes. 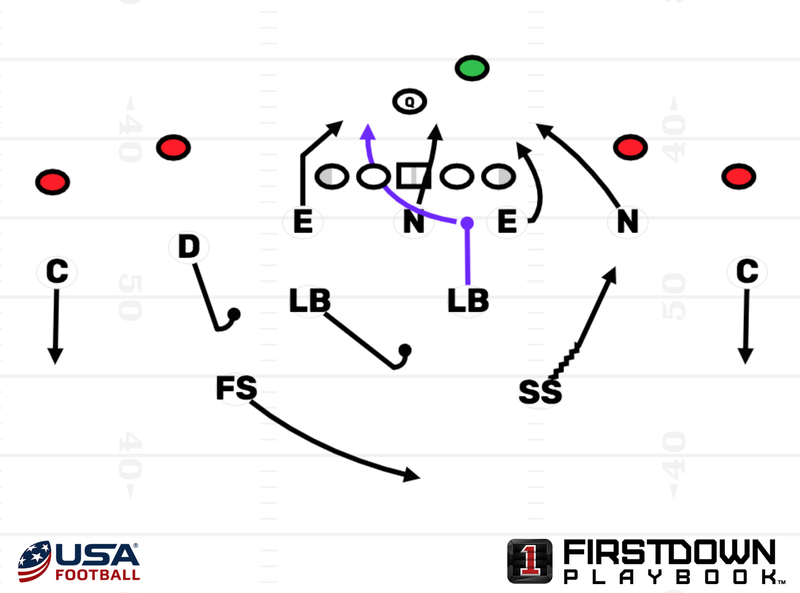 Much like Manny Diaz at Miami, who has popularized the fire zone blitz and been very successful because of it (Learn how Manny Diaz&apos;s "Fire Zone&apos;s" helped Miami lead the country in TFL&apos;s), Penn State makes a living in the backfield utilizing the fire zone. The fire zone concept is bringing a five-man pressure while covering with six, giving up one of the middle hook zones. Against Appalachian State in an early season test, Penn State hit home on the fire zones they were running and it ultimately helped Penn State win the game. One example is drawn up below. The concept in this fire zone is to delay blitz a linebacker to find the open blitzing window to get to the quarterback. Penn State loves to utilize these types of blitzes in third down situations to force teams to get rid of the ball faster than they want to while also providing a safe coverage on the back end. Another thing you notice immediately after watching them on film is how good Penn State is at setting the pocket and collapsing it. When Penn State sets the pocket, they do a good job of forcing the quarterback to step up into the pocket and not escape outside of either defensive end. Forcing the quarterback to step up into this pocket allows their defensive ends to then collapse it as they rush up field, forcing opposing quarterbacks into a no-win situation. An example of this comes from late in the first half against Michigan State. In the attached clip, both rush ends set a hard edge as the pocket becomes defined. What Penn State is not allowing is the quarterback to see the inside rush of the end so that the quarterback goes into scramble mode. As Penn State rushes hard up field, as soon as they get to the level of the quarterback, they dip and rip back inside, immediately rushing the quarterback. By doing this, you are helping out your linebackers and limiting where the scrape contain help is going to have to come from. Keeping the quarterback up inside will help the back end of your defense as well and ultimately shorten the cover time for your safeties and defensive backs. With all of that said, one of the main reasons Penn State is so good at sacking the quarterback is they are fundamentally sound at the point of attack. You hardly ever see out of control blitzers or rush ends getting caught inside. When they line up and you are dropping back to throw the ball, you are going to get a fast, physical and disciplined pass rush that more often than not will cause havoc for your offense and your quarterback.